Kings XI Punjab will be looking to get their campaign back on track after a couple of defeats when they lock horns with bottom-placed Rajasthan Royals in the Indian Premier League in Indore on Sunday. While Kings XI Punjab are fourth in the table, with five wins and three losses from eight appearances, inaugural edition winners Rajasthan Royals are last with three victories and five defeats. Like Kings XI, Rajasthan Royals too are coming off two straight defeats, but the Punjab outfit is better-placed and pretty much in with a chance to qualify for the play-offs. While they would regret letting Mumbai Indians off the hook at the Holkar International Stadium on Friday night, Kings XI are a side capable of making a turnaround. For a team that boasts someone like Chris Gayle at the top of the order, it can always afford to hope. That the big-hitting Jamaican has been in red-hot form in this ongoing edition of the league only adds to their confidence. With his stupendous run of form, Gayle has already silenced his detractors and if his brisk fifty against Mumbai Indians is any indication, he is no mood to relax as yet. While his bowlers were taken to the task by Rohit Sharma and Krunal Pandya in the last five overs, KXIP skipper Ravichandran Ashwin blamed his batsmen for not putting enough runs on the board after they went down to Mumbai Indians. 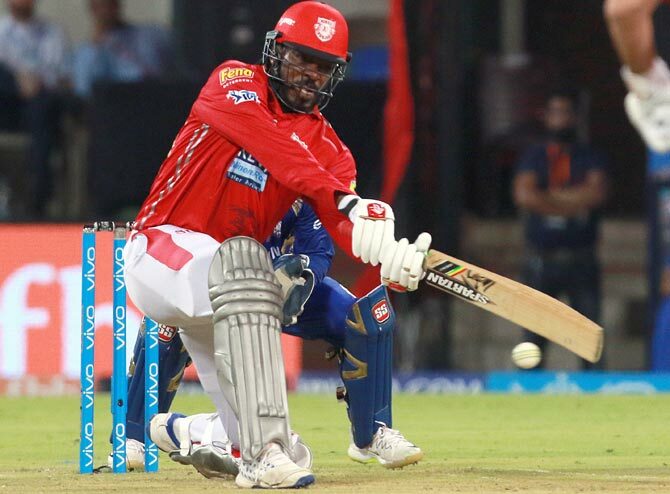 Put in to bat, Kings XI Punjab failed to capitalise on a good batting track and barring Chris Gayle's 40-ball fifty, no other top-order batsmen stood up. It was Marcus Stoinis's (29 not out off 15 balls) last-over blitz that carried Kings XI Punjab to 174/6. Ashwin, nevertheless, sounded optimistic of better days ahead. "We fought well, if a few things had gone our way, we might have ended as winners (against MI). We bowled pretty well, but this wasn't our night," Ashwin said after the game against Mumbai. He refused to believe that the week's break had any impact on the team's performance. As far as Rajasthan are concerned, Englishman Jos Buttler will be the one to watch out for. Fresh from his 18-ball half century against Delhi Daredevils, Buttler will look to replicate that showing tomorrow, albeit in a winning cause this time. Skipper Ajinkya Rahane would himself look to score some quick runs and inspire his success-starved players. The last time RR emerged victorious was on April 22, against Mumbai Indians, and they would be eager to get back to winning ways. Rajasthan Royals: Ajinkya Rahane (captain), Jofra Archer, Jos Buttler, Shreyas Gopal, Krishnappa Gowtham, Heinrich Klaasen, Dhawal Kulkarni, Ben Laughlin, Mahipal Lomror, Sudhesan Midhun, Sanju Samson, Jatin Saxena, D'Arcy Short, Ish Sodhi, Ben Stokes, Rahul Tripathi, Jaydev Unadkat. Kings XI Punjab: Ravichandran Ashwin (captain), Chris Gayle, Aaron Finch, KL Rahul, Karun Nair, Mohit Sharma, Mujeeb ur Rahman, Barinder Sran, David Miller, Andrew Tye, Ankit Rajpoot, Axar Patel, Akshdeep Nath, Mayank Agarwal, Manoj Tiwary, Yuvraj Singh, Marcus Stoinis, Mayank Dagar.